For those who want to order the creation of an online store and are looking for a reliable platform for e-commerce, the OpenCart content management system is ideally suited. We opt for OpenCart, as it is one of the best solutions for e-commerce, which allows you to develop an online store with all the standard features that are required for easy site and product management. Unlimited number of goods and manufacturers. Ability to expand with templates. Supports over 20 payment gateways. Delivery calculations (weight and size). Provides great opportunities for marketing and promotion. 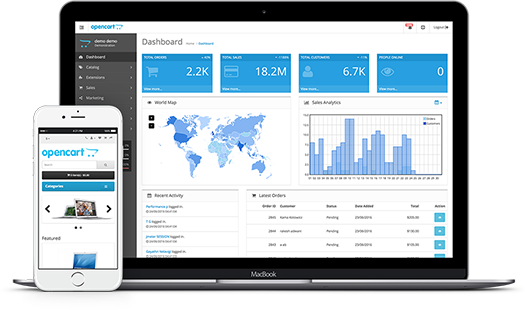 OpenCart is very convenient for managing the store, products, orders and, in general, everything that happens on the site. The admin interface itself is well structured and understandable. In addition, OpenCart allows you to manage multiple stores from one administration panel, even if they have different design, product modules, databases and languages. The platform is easy to use and can be used by anyone who finds such a desire. If you are interested in developing an online store that sells and makes money, we will be glad to help you! pages. Pages on the site are loaded in a few seconds, which is convenient for buyers and saves them time. SEO. Opencart's online store can be easily optimized for search queries, edit descriptions, headers, and add keywords.